Lose 5% body fat, gain 10 lbs of muscle, 50 more lbs on your deadlift, 1 minute faster in your mile time, 10 more unbroken pull-ups, 5 more reps on your Tabata squat score or 2 minutes faster on your "I Am CrossFit" time...These things are all possible! But let’s be real. How could any of this stuff really happen? Here is my spiel...If you want any of these improvements in your overall fitness then you’d better be willing to step up and make it happen! The reality is that 45 minutes two or three days a week in class is a great start and will enable you to see results in these areas, but it’s not enough to really get you where you could be. Unassisted pull-ups and ring dips, real push-ups, 20 and 14lb Wall Ball to 10 ft for 20 unbroken reps should all be in your repertoire. 8) Train or run on your own if you can't do extra with us! Find a classmate to work on deadlifts, back squats, etc. with. Find a school/park with monkey bars and take a KB and jump rope with you! 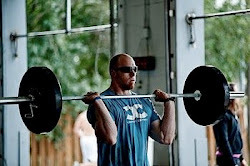 9) Watch videos on http://www.crossfit.com/ to learn how! 10) Stop Thinking You Can't! Welcome to June Programs! See you there with only the best attitude you've ever had! One Focus, One Goal, One Drive! Get Better Today...This is Life!